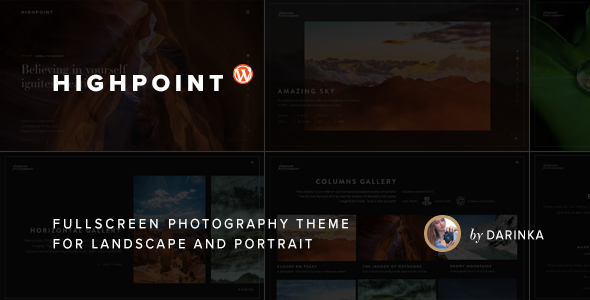 Highpoint is a modern photography theme featuring lovely fullscreen and proportional galleries, clean well-commented coding and a timeless design. I created this special photography theme to showcase the best work of you, my buyers â€“ the photographers. Its minimal and sleek design is almost invisible and thus perfectly frames your pictures. Smooth scrolling animations accentuate each individual photograph. The theme is easy to use and set up. … and of course, you get support directly from me, the developer. Change your gallery style with 1 click in your admin panel! Upload all your images via standard WordPress Add media feature in seconds! Galleries are standard WP galleries, add hundreds of photos easily!